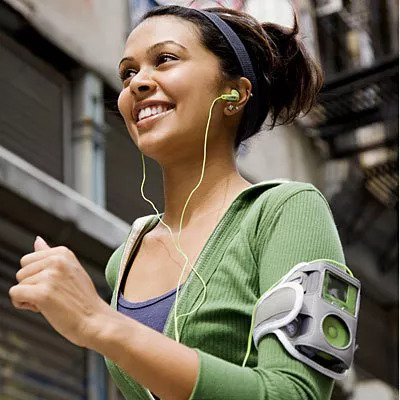 Whether you're looking for entertainment or running tips, these podcasts will help you get through a long distance run. Many runners say they love the sport because it gives them a chance to be alone with their thoughts. But if youâve ever trained for a long-distance race, you know thatâs an awful long time to be alone with your innermost desires or that same old Top 40s music on your iPod. Usually free and frequently updated, podcasts are a great alternative when you just want to zone out as you log the miles. Whether youâre looking for entertainment, personal growth or just to learn how to run faster, you can find a show to fit your mood. We asked pro runners, running bloggers and coaches for their favorite podcasts to give you a heavy dose of motivation as you hit the pavement. Whether you eat like a caveman or are just curious about the Paleo diet, Practical Paleo author Diane Sanfilippoâs podcast is a go-to for anyone curious about the grain-free, dairy-free lifestyle. With cohost Paleo blogger Liz Wolfe, Sanfilippo covers everything from what to eat to lower cholesterol and why you need to give up gum to see results from a sugar detox. If youâve ever watched The Biggest Loser, youâre used to seeing âAmericaâs Toughest Trainerâ giving the contestants her signature tough love approach. But her free, weekly podcast sheds light on a more vulnerable side of the brash fitness superstar, showing how she deals with underlying causes of behaviors like emotional eating to push through her own barriers. Pro runner Deena Kastorâwho recently shattered the World Masters Half-Marathon recordâis a huge fan. âI love anything that has to do with optimism and progress,â she says. Youâll learn everything from the power of self-compassion to how to be happier at work. While this NPR quiz-show format podcast rarely discusses running or fitness (though its host, Peter Sagal, is a 3:20 marathoner himself), itâs still popular among runners. Its devotees say that the format keeps them thinking as they follow along. The show tests its guests on current events and trivia. A popular segment, âNot My Jobâ quizzes guests on topics completely and utterly out of their wheelhouseâlike asking Arizona Senator Jeff Lake about winter sports. âIâve been known to answer the questions out loud on occasion,â says blogger Mindy Nienhouse from Just a One Girl Revolution. If your training plan is calling for six miles or more, youâll want to fire up this podcast on your phone. The episodes are typically at least an hour long, giving you plenty of material as you tick off the miles. Rich Roll, a vegan ultra-endurance athlete (heâs done five Ironman-distance triathlons in less than a week!) covers everything from the âspiritual road to athletic supremacyâ to meditation for kids. âHeâs kind of a hippie, other-worldly ultrarunner, but his voice just brings such peace to my own spirit!â says blogger Katy Widrick. Triathlete Ben Greenfield may be a top-ranked triathlete and five-time Kona Ironman World Championships competitor, but his show is still accessible to newbies and seasoned athletes alike. Touching on topics ranging from how bad beer really is for you to how to mitigate damage from endurance sports, this podcast will teach you a thing or two while you check another run off your training plan. Heâs known for explaining new training strategies, like the Maffetone Method, so listen up if youâve got a new PR on the brain! If youâre not ready to commit several months of your life to training for the big distance, you can live vicariously through this podcast. Host Joe Taricani is known for interviewing guests during marathons to give a true on-the-ground look inside a race. He talks to everyone from race directors to medical professionals and suppliers about what it takes to put onâand get throughâ26.2 miles of fun.